Sunday night, Kobe Bryant announced that 2015-16 will mark his final season in the NBA. In between making the announcement via The Players Tribune and holding an extended press conference at Staples Center, the five-time champ took the court in the Lakers 107-103 loss to the Pacers. In the game, Kobe scored 13 points, on 4 of 20 from the field. 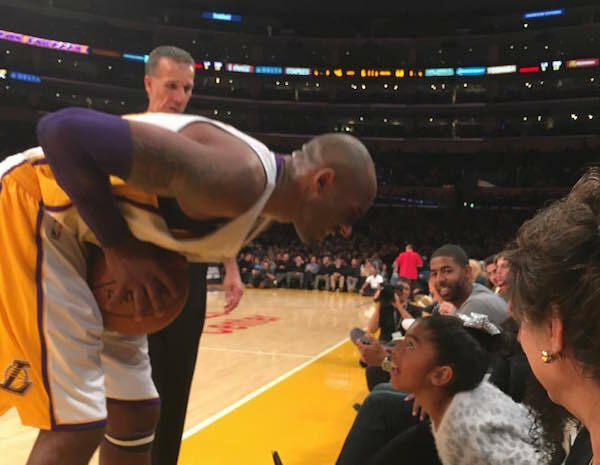 Here is an up close original photo of Kobe saying hello to his daughter during Sunday’s now historic game. The picture was provided by Richard Harris, the boy’s basketball coach at Malibu High School. Prior to pursuing a career in coaching, Harris worked in studio production for ESPN. Click here to purchase cool Kobe holiday gift for kids.